Download and install Desktop Right Click Menu Manager on a Windows Vista Computer. Now in the main screen of desktop right click menu manager, enter the name you wish to appear on the Desktop Right Click Menu (Let's say Notepad for this example). Now Click on the Button named ... to browse to notepad.exe. Finally Click on Add New to add Notepad to your Desktop Right Click Menu. 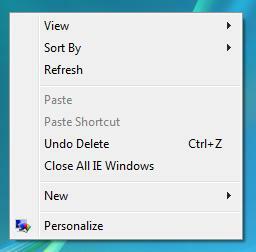 Given below screenshot displays a modified desktop right click menu. In the given below the new menu item's text is in english language, whereas you can enter any language you wish to be added in the Desktop Right Click Menu Name, in the above screen. 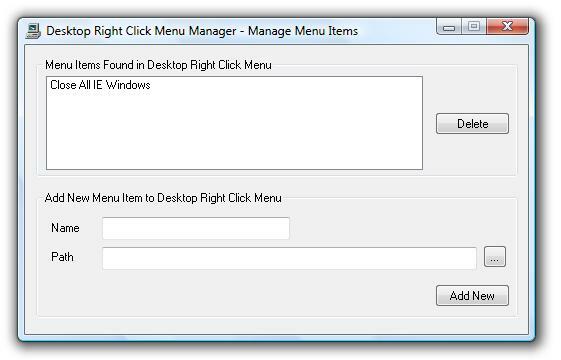 Desktop Right Click Menu Manager works on Windows Vista only, it will not work on Windows XP, Windows 98, etc. Register Your Software Licence and get Turn Off Monitor and Desktop Right Click Menu Manager Software Utilities and more.